Fineholm is privately owned, family run business, established since 1974, dealing with residential letting and estate agency throughout Glasgow, Edinburgh and the surrounding areas. We aim to provide a professional and friendly service to all our clients- whether you are a buyer, seller, landlord or tenant. To offer a friendly approachable service with no airs or graces. We know all too well that buying or renting a property can be daunting, we are happy to give advice to everyone, regardless of their property needs! A professional service, regulated by ARLA and TPO. We are not the cheapest, but 0% fees = 0% effort in our opinion, and in order to offer a good service level we need to charge reasonable fees. 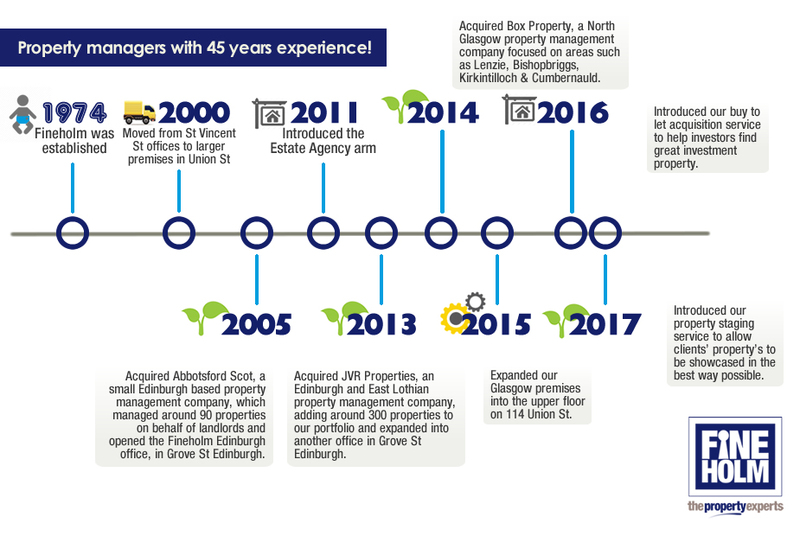 We have been in business for over 40 years unlike some agents who are here today gone tomorrow! We have grown from a small agency with only 4 members of staff to a market leader with over 35 members of dedicated, skilled staff, many of whom are ARLA qualified, so you can be assured of professional, experience driven advice. We choose to operate Fineholm from 2 city centre based offices, one in Glasgow beside Glasgow Central Station, and one in Edinburgh’s Haymarket, which enables us to focus on delivering great service to all our clients regardless of where they or their property is based.